Look close, there is a cod fillet under those lemon slices! After going to two stores, I could only find 5 oz frozen portions of cod. I would have preferred a larger filet and fussed at the meat manager about it. 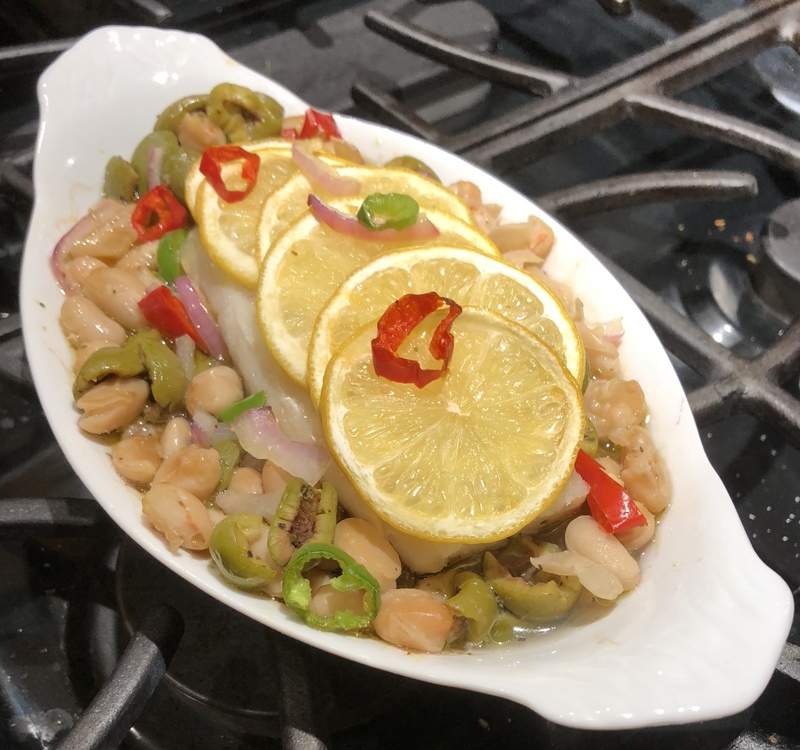 The flavors of roast cod, creamy cannellini beans, lemon, chile and Castlevetrano olives are stand alone favorites in this house. Finding a recipe that brings them all together is worth celebrating! Castlevetrano olives are green and totally different in flavor than the green Spanish olives we slip into martinis. They are worth the search and you will want to buy plenty because you will sample so many you might not have enough for your recipe. Preheat oven to 300º. Combine oregano, beans, olives and 1/2 cup water in a shallow 3-quart baking dish; season lightly with salt. Place fish on top and nestle into beans; season fish generously with salt. Scatter shallots and chile over fish. Slice lemon very thinly and wriggle out seeds. Arrange slices, slightly overlapping, over surface of fish. Drizzle everything with oil and roast until fish is opaque throughout and flesh in the center flakes when gently pressed – 25-35 minutes, depending on the type and thickness of the fish. Let rest about 10 minutes. Press the beans down occasionally so they don’t dry out. Cut remaining lemon into wedges and serve alongside fish and beans for squeeing over. *Shopping in El Paso can sometimes be frustrating, but it does foster creativity. I couldn’t find Fresno chiles, so I substituted slices of red shishito peppers and about a half-inch piece of finely minced serrano pepper for heat.